Inspired by the most prestigious marble of Italian tradition, Atlas Concorde's Marvel provides strikingly gorgeous and realistic marble looks in beautiful Italian-made porcelain floor and wall tile. ISC Surfaces stocks the following colors, sizes and finishes. Additional items in this line are available on a special order basis. Marvel's pure colors, natural veining and transparent shading recreate the surface of the most sought-after marble with surprising realism. 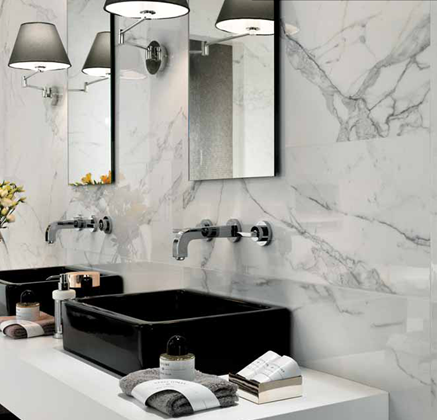 The intensity of each color faithfully interprets natural marble with the added advantages of porcelain tiles. Marvel is available in polished or matte finishes. The polished finish, surprisingly brilliant and bright, features slight irregularities typical of natural marble. The matte finish is suitable for projects requiring top technical performance. For additional Marvel details and photos, please visit Atlas Concorde's web site here.